MIME (Multipurpose Internet Mail Extensions) were a technique for describing and attaching files to Internet mail by converting raw binary files to printable ASCII (American Standard Code for Information Interchange). They have since been expanded for use in HTTP (Hypertext Transfer Protocol) to describe the content of messages and downloads from to and from servers. This Applet will tell you what your server is sending for MIME types and what it should be. If you discover errors in the what it server is sending, notify the ISP (Internet Service Provider). If you discover errors in what the MIME type should be, email me at . MIME is also a way of specifying the format of web documents and attached email documents. The webserver gives two hints to the browser what sort of data it is sending it: the extension in the filename and the MIME type in the HTTP header. The web server usually derives the MIME type by looking at a table of file extensions. If the web server fails to do this, often the file contents are just displayed as gibberish rather than properly acted on. In Novell Servers there is only one such extension-to- MIME translation table per server, not one per website hosted. Just send an email to your ISP telling them the extensions you need to support and the corresponding MIME types. In particular, you must tell your ISP to set up associations from extension to MIME type for all the Java file types such as *.class, *.java, *.jar, *.jnlp, *.jardiff and *.ser. MIME types are referred to in the RFC 1945 HTTP 1.0 specification as media types types. The content-type and content-encoding fields in the RFC 1945 HTTP header together give a hint to the receiver what kind of data has just been handed to it. IANA is responsible for assigning new MIME types. Unfortunately naming is even more chaotic than the extensions, often with several conflicting MIME types for each extension. Unfortunately, MIME has made the problem it was intended to solve even worse. It matters not what the official name is, but the MIME name configured in the majority of the world’s browsers is. I have found Filext.com the most useful source. MIME types and extensions associated with them. asx video/x-ms-asf Microsoft video playlist. XML, with entries giving URL for each file to play in order. batfrag text/plain fragment of a bat file. bin application/octet-stream application/x-macbinary executable program. You can use it for any file you want simply downloaded and as an intact binary. E.g. it would be useful for *.upd files in the Automatic File Update student project. com application/octet-stream executable program. You can use it for any file you want simply downloaded and as an intact binary. E.g. it would be useful for *.upd files in the Automatic File Update student project. css text/css Cascading Style Sheet. csv text/comma-separated-values MicrosoftÃ¯Â¿Â½s format for import/export to Excel, Word and Access. doc application/msword Microsoft Word document formatted. ear application/java-archive enterprise archive, EJB app, compiled compressed java plus data members. exe application/octet-stream application/exe, application/x-msdos-download, application/x-msdownload, magnus-internal/cgi Windows executable program. Refered to as an application type in the associations editor. gvi application/x-gsp Google Video, copy protected. hlp application/octet-stream Windows old-style help file format. See also chm. This is the MIME type Microsoft uses on its servers. jad text/vnd.sun.j2me.app-descriptor J2ME cellphone or handheld application. jar application/java-archive application/x-jar compiled compressed java plus data members. jardiff application/x-java-archive-diff java jar update file, contains only jar members that have changed. jnlp application/x-java-jnlp-file Java Web Start application descriptor XML file. jsa application/octet-stream JRun Server Application. 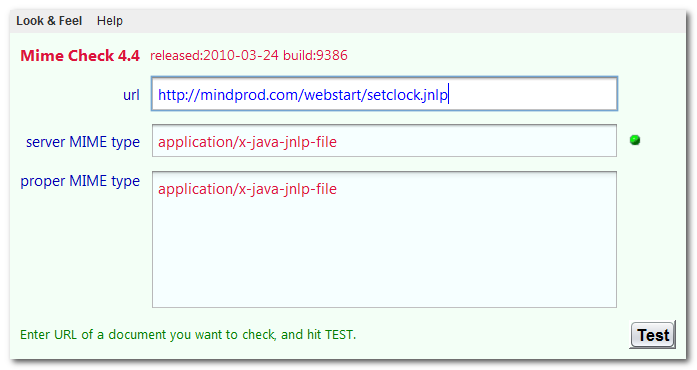 JRun is a Java Servlet and JavaServer Pages (JSP) engine. mp3 audio/mp3 audio/mpeg, audio/x-mp3, audio/x-mpg mp3/mpeg compressed audio. Popular format for portable music players. ogg audio/x-oggvorbis application/ogg encapsulation for Vorbis I non-proprietary audio or video. rng application/ringing-tones Nokia phone ringtones. Also used for Relaxing.org schema files. rss application/rss+xml text/xml for RSS-2 podcasting feeds. Unfortunately, it does not distinguish between text, audio and video. RSS-1 uses application/xml or application/rdf+xml. scr application/octet-stream Windows screensavers containing executable code. Beware! Frequently contain viruses. shtml text/x-server-parsed-html server side includes; web server expands embedded commands. Sometimes htm and html files are parsed for embedded commands too. ssi text/x-server-parsed-html server side includes; web server expands embedded commands. Sometimes htm and html files are parsed for embedded commands too. swf application/x-shockwave-flash Shockwave Flash, not straight white female. war application/java-archive web archive, servlet app, compiled compressed java plus data members. wmv video/x-ms-wmv Microsoft compressed video. Play with Windows media Player or Winamp. Winamp lets you slide forward and back. xml application/xml application/xml-dtd, application/xml-external-parsed-entity, text/xml, text/xml-external-parsed-entity text/xml implies display. application/xml implies download. xsd application/xml text/xml text/xml implies display. application/xml implies download. otf, OpenType font files, don’t yet have an assigned MIME type. binary (unencoded, any characters, lines may be long) not used in practice. All these use a wrapper consisting of MIME header fields ahead of the data and and a trailing end-of-data marker string highly unlikely to occur accidentally in the middle of the data. Eventually this printable encoding will be dropped. Base64 encoding, for example, adds 33% overhead to the transmitted message size. The Internet is now almost completely converted to 8-bit, so it should not usually be necessary. If you are setting up a Java Website, make sure you set up at least these MIME types. There is a database of MIME types and extensions in the Windows Registry. At some point I will mine it for more entries. HKEY_CLASSES_ROOT\ MIME \Database\Content Type\application/x-java-jnlp-file. You can get a list of Windows extensions and associated MIME types by typing assoc at the command prompt. HTML (Hypertext Markup Language) forms use application/x-www-form-urlencoded, though there is no filename. The whole MIME scheme is disorganised. What determines how your browser displays, executes or downloads any given URL (Uniform Resource Locator) depends on its extension, the MIME type the website assigned that extension, the MIME type your browser assigned that extension and the MIME type your operating system assigned that extension, the program your browser assigned to that MIME type and the program your operating system assigned to that MIME type and probably the current phase of the moon. There is no way to attach a MIME type to a file. It has to be generated from the extension anyway with tables maintained on the server. There is no way to deal with files with different MIME types but the same extension anyway. MIME fails in its primary objective. Some websites ignore MIMEs entirely and call everything text/plain. There are duplicate MIME names for the same file type. There is no official list of MIME names anywhere. There is no one in charge of assigning MIME names. IANA (Internet Assigned Numbers Authority) supposedly is, but they don’t seem to keep properly formatted records about MIME names, their extensions and uses, they don’t assign names to avoid duplicates. There are many file types without assigned MIME names. MIME 7-bit encoding wastes bandwidth. MIME types are mapped from extensions to MIME types on a global, one-size-fits-all website-wide basis. The whole point of MIME types was to resolve the ambiguity of the same extension being used for two different purposes. To work properly MIME types need to be attached to files, just the way their human names are. In summary MIME S are a half-assed solution to a problem that has created more of a problem than it solved. You can find out what MIME types various web servers and sending at you with Rex Swain’s HTTP viewer. It lets you see what a browser would send if you submitted a URL and what the website would send back. Great learning tool for HTTP in general. Here is one offial source for MIME types: The definitive IANA list however it has only a fraction of the total is use. Tell your ISP what MIME types and extensions you need. If you have an Apache server, you can configure it yourself simply by uploading a file called .htaccess to your website’s root. The file .mime.types in the user’s home directory. The file C:\Program Files\java\jre1.8.0_131\ /lib/mime.types. The resource named META-INF/mimetypes.default in the activation.jar file. What happens with file:// URLs (Uniform Resource Locators) to access local files? You don’t have a webserver out there providing MIME types in the HTTP headers. In Windows, in the registry, is an association from extension to MIME type, which they call content type. However, Java ignores this.